Don't waste your life not doing something you aren't brilliant at, not setting the world on fire with your ideas, your thinking, your inventions, your words — it doesn't matter how you do your Thing, what matters is that you DO IT! And how about turning that Thing into your business too? Lucy Whittington is on a mission — she wants everyone in the world to do what they're brilliant at and not just what they're 'good' at. Having done what she was 'good' at for a long time (marketing), and getting overqualified with an MBA, Lucy realized that her 'Thing' was finding other people's Thing and helping them turn it into a great business that they love. In this book, Lucy uses her proven five-step process to help even more people find what they are brilliant at. Receive guidance on taking your new business to the next level by creating your "Star Plan"
Imagine being so gifted that the work you are paid to do comes as naturally as breathing, and is so enjoyable that you would do it for free. It can happen. You're gifted at something, and that something is marketable. You can put yourself on the path to your ideal life, but first you have to Find Your Thing. 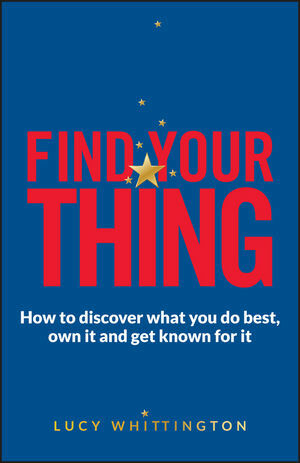 Lucy Whittington works with hundreds of clients worldwide on finding their thing – online and in person. She has run a marketing consultancy since 2005 and launched Being a Business Celebrity in 2010.